How to Grow: Lettuce is a cool-weather crop that thrives in the temperature range 60-65 degrees F, and if thoroughly hardened, most varieties survive temperatures as low as 20 degrees F. Cold-adapted varieties survive much lower temperatures. Seed germinates best at about 75 degrees F. Lettuce seed will germinate at a temperature as low as 40 degrees F. Early spring plantings should be made as hardened transplants from seed started one month before setting outdoors. Later plantings can be direct-seeded. Sow seed 1/4" deep and thin to 10-16" apart depending on the variety. Loose-leaf varieties may be planted more closely but good air circulation should be maintained around the plants. Soil should be cool and moist during the germination period. Germination Notes: If the temperature exceeds 80 degrees F lettuce will often fail to germinate. Lettuce can be planted during late summer or early fall while the days are still hot provided that the seeds are germinated in the refrigerator for 4-6 days. Another method is to soak seed in 10% bleach for 2 hours at 40-60 degrees F followed by 4 water rinses. This method enhances both the speed and amount of germination. One more method is to keep soil cool with burlap or boards; remove cover promptly after germination to keep grasshoppers and other pests from enjoying the shaded tender sprouts! Bolt Resistance: Resistance to bolting is highest with loose-leaf lettuce, followed in order by romaine, butterhead, and bibb, and crisphead. Lettuce bolts more readily if exposed to temperatures below 50 degrees F during the 2- to 3-leaf stage (the first three weeks after germination). Thus, spring lettuce is best started indoors and transplanted out at least 3 weeks after sowing. Before the days become hot, mulch the plants to keep the root temperature cool. In deep summer heat it's difficult to mature quality lettuce--heads become smaller and less sweet--at that time of year, cucumber and tomato salads are the easiest! Harvest and Flavor Notes: The glucose content of lettuce harvested in the morning may be 2-1/2 times greater than lettuce harvested in the early afternoon. For best quality and maximum sweetness harvest by 7-8 am, especially in summer. Greenhouse Note: Use heat-tolerant, loose leaf or bibb types. Insect Pests and Diseases: In the greenhouse, control aphids by means of ladybugs, sticky yellow traps or by insecticidal soap. Maintain good air circulation around plants to reduce disease. Maturity Dates: Dates are from direct seeding. Subtract 15-20 days for dates from transplanting. Seed Savers: Isolate varieties by a minimum of 12' for home use. For pure seed isolate varieties a minimum of 25-50'. Packet: 0.5g unless stated (approximately 400-625 seeds, depending on variety) sows 30' direct seeded or 175' as transplants. Extend Your Lettuce Season: Begin lettuce production early and keep it going later in the season by covering plants with a Reemay blanket (p. 87). Extend your harvest into early summer with this technique: plant tall vegetables in north-south rows and plant heat-resistant lettuce underneath the leaf canopy so that it is shaded during the hottest portion of the day. Corn planted in rows 4 feet apart or pole beans on a fence or trellis is ideal. Interplanting lettuce with bush squash also gives good results. Mulch the lettuce well, keep well watered and enjoy! Romaine lettuce produces upright, elongated tall heads with thick succulent ribs and distinctively flavored long thick crinkled leaves. Moderately tolerant of heat and shade, romaine does best in a loose fertile soil, and is the most nutritious type of lettuce. Buttercos lettuce has the characteristics of both butterhead and cos.
Loose-leaf lettuce is a non-heading type of lettuce, second to romaine in nutritional value, and generally the easiest type for gardeners to grow. As a group it is the most forgiving of poor soil, is generally more heat-tolerant, and contains the largest diversity of attractive heirlooms. Bibb lettuce is more tolerant of hot weather than crisphead lettuce. As a group it is best for cooler regions, with some notable exceptions. Intermediate in nutritional value, it has small loose green heads with blanched yellow interiors and thin, soft-textured leaves. Crisphead lettuce is the most popular type, appreciated for its tightly folded blanched crisp leaves, though less nutritious than other types. Because it is harder to grow to perfection, we offer varieties that are more adapted for hot regions. 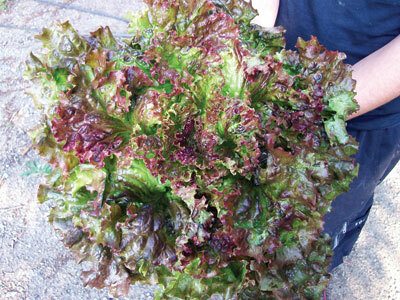 Crisphead lettuce should be set out early in the season since it requires a long cool season. If heads have not formed by late spring, shading with cheesecloth or screening is recommended.